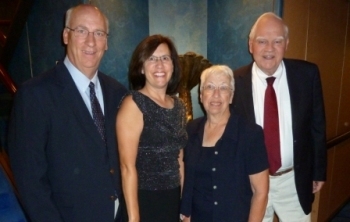 Onboard the Holland America Noordam, we were ready for the first formal night. 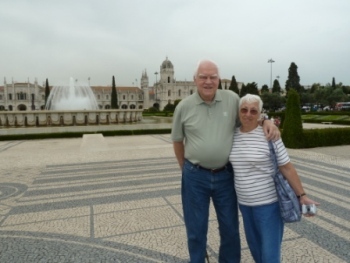 At our first port of call - Ponta Delgada, São Miguel, Azores - we admired the dizzying black & white tile designs near the Town Gates. 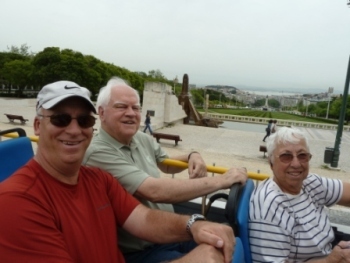 As we sailed up the Tagus River into Lisbon, Portugal we passed the Monument of the Discoveries and St. Jerome's Monastery behind it. We sat on the top level of the double decker Hop on Hop Bus. The weather was perfect and so were the sights. 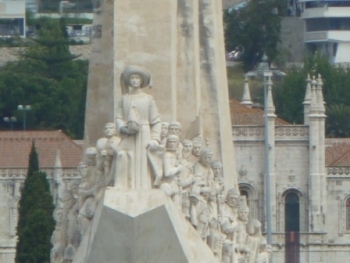 The Praça do Imperio in front of the Monastery, sported fountains and statuary along with astrological symbols in the black & white tile designs. 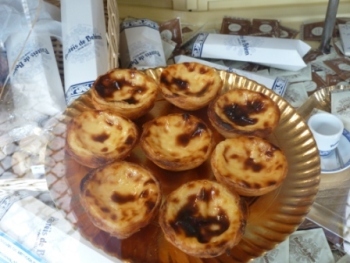 Of course, we tried & loved the famous pastéis de Belém still hand-made with a 200 year old recipe. 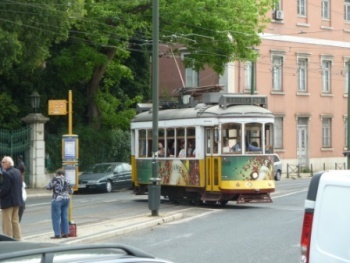 The next day we caught a small tram to weave through the narrow streets and hills of the historic section of the city. 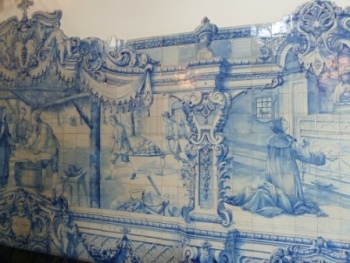 Beautiful portuguese tiles were everywhere - both inside and outside of the buildings. We liked the Yellow Bus Hop on Hop off tour. 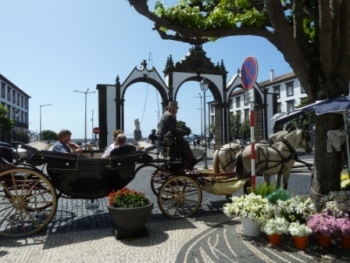 The 15€ ticket was good for 24 hours and included rides on the tram, bus, funicular and minibus routes. 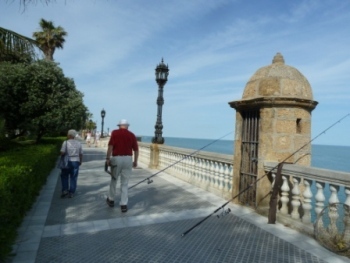 as they sat in the parks and strolled along the seaside walkways. 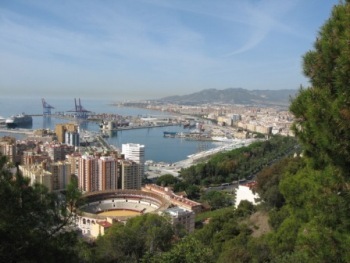 Nothing says "Spain" like a plate of pimientos de Padrón with a glass of San Miguel and a tinto that we enjoyed in Málaga, along with a panoramic view of the city and bullring below. 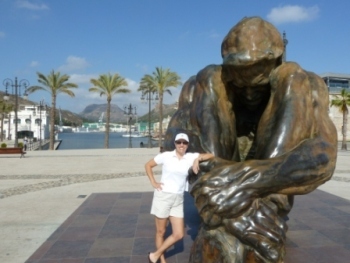 The wide plazas with sculptures and a pedestrian main street in Cartagena, Spain were great places to spend another day with perfect weather. 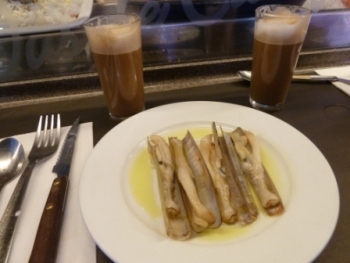 Barcelona was still serving delicious razor clams with tall cups of espresso. 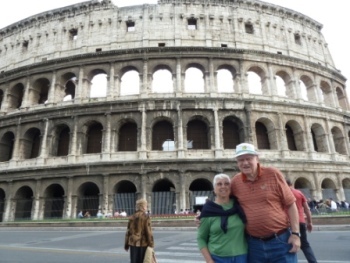 Guess who was seen at the Coliseum in Rome? 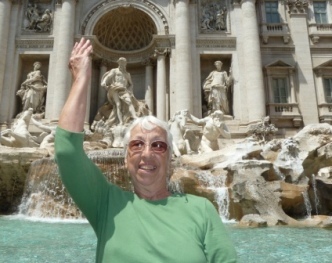 The Trevi Fountain just received one more donation. Mom will be back! Where's Waldo? 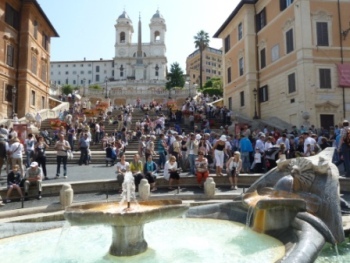 Dad and Paul sat on the Spanish Steps while Mom & Vicki shopped nearby at Prada & Gucci. 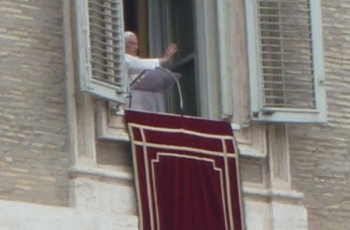 Pope Benedict XVI gave a blessing to the masses of people gathered in St. Peter's Square. 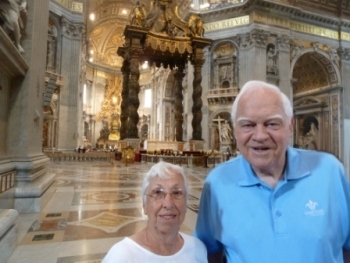 We were inside the Vatican on Sunday morning. 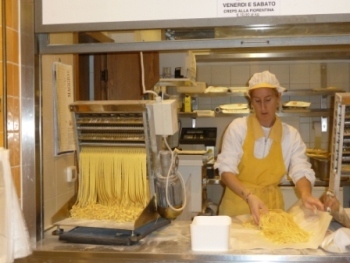 The Mercato Centrale (Main Market) in Florence had a fresh pasta shop. We bought raviolis stuffed with ricotta & spinach to serve with shrimp scampi, garden tomatoes, local olives and Florentine pastries for dinner. 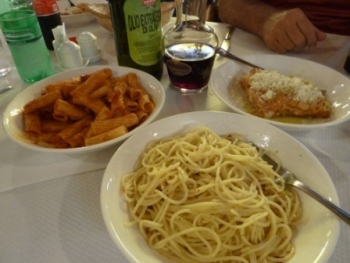 What says Italy more than a huge plate of pasta? 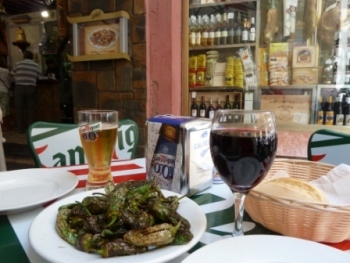 We ordered the menu of the day for 11€ per person ($13.75 USD) with tip. That included the pasta, roast chicken or spedini, a salad, wine, water & coffee! 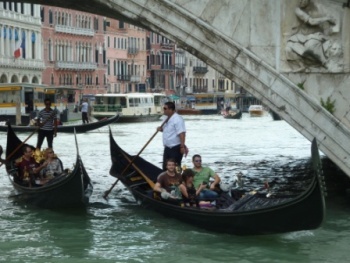 As we entered Venice on the Grand Canal, we had to work through a traffic jam of gondolas under the Rialto Bridge. 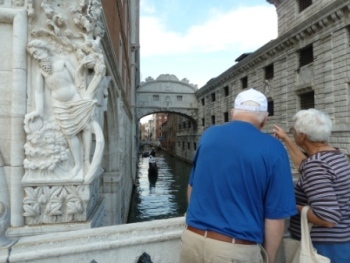 Mom pointed out the Bridge of Sighs next to the Doge's Palace on Piazzale San Marco. 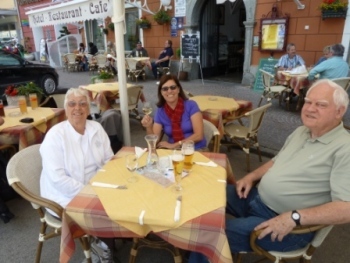 On our way north to Salzburg, we stopped at the artisan village of Gmünd. 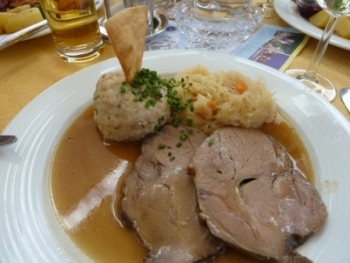 Our inexpensive lunch at the Gasthof Kohlmayr of roasted pork in gravy with dumplings and homemade sauerkraut was delicious. 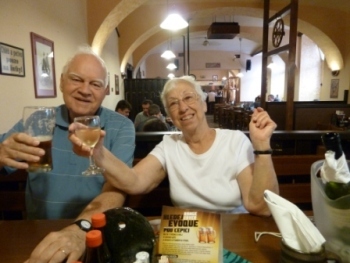 Pizzaria Alba Chiara, Via Gobbi 236, Venezia-Campalto - We were the only non-locals in the restaurant. Home cooked daily special 11€ menu includes a first course pasta choice & second course meat choice, salad, wine, water & coffee. Gasthof Kohlmayr, Hauptplatz 7 - Beautiful cafe on the main square. Looks expensive, but has wonderful prices (under 10€) for great plate lunches. Lots of locals. 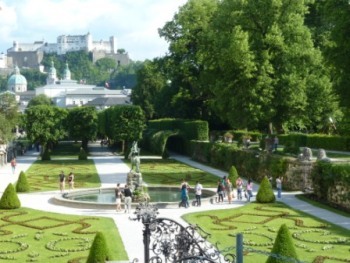 Salzburg's Mirabellgarten was a fun place to walk in the perfect weather. 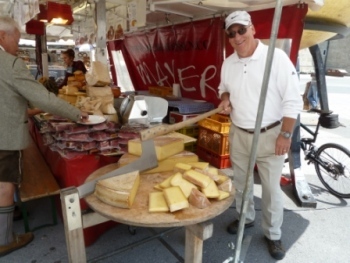 In the historic city center, Paul "cut the cheese" at a festival food booth. 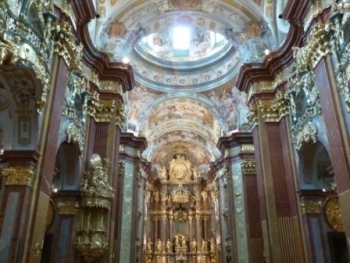 Melk Abbey was filled gold leaf and relics of several saints. We joined the noon day prayer service and listened to the lovely organ music. 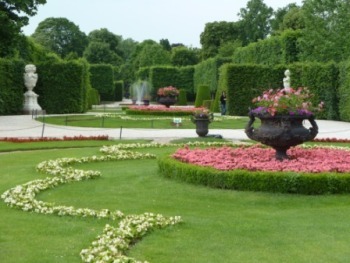 In Vienna, Schoenbrunn Palace was less than a block from our hotel. 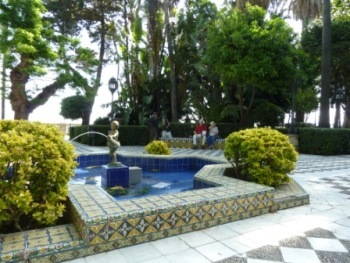 We strolled through acres of quiet gardens and fountains. 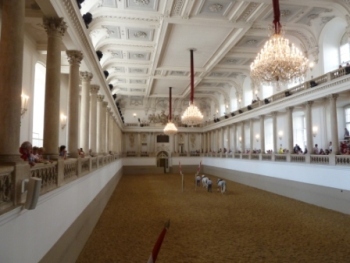 To celebrate Dad's birthday, we attended the morning exercises of the Lipizzaner Stallions at the Spanische Hofreitschule (Spanish Riding School). We had perfect seats in a ballroom setting, complete with huge chandeliers. 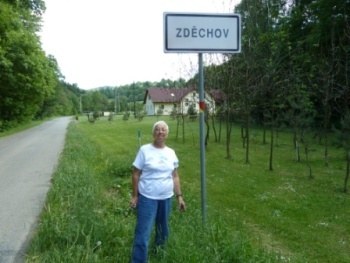 Mom had her dream come true when she stood in the Czech Republic village of Zdêchov, the town where her great-great-great grandfather was born. 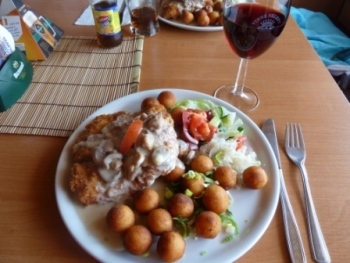 All that family searching made us hungry for a Czech fried chicken steak smothered in mushroom gravy, served with cucumber salad and croquettes. 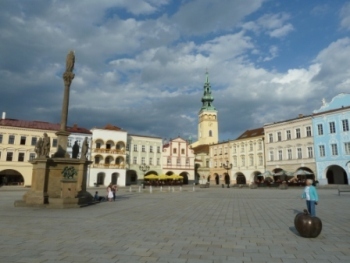 That evening we walked around the colorful city square in Novy Jicin. 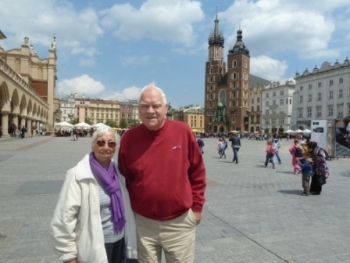 Our apartment in Krakow, Poland was only steps from the Old Market Square, which was a fun place to be day and night. Close by ul. 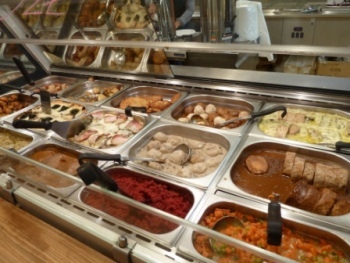 Grodzka 6 served a buffet of delicious traditional Polish foods. We ate there for under $5 USD per person. ul. Grodzka 6 (the name is also the address) is located right off the Old Market Square. 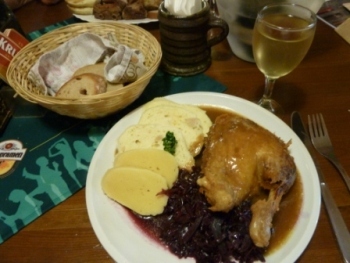 Everything we had was delicious - bigos, red cabbage, meatballs in gravy, platky, Kielbasa with sauerkraut, pork stuffed with wild mushrooms and tall glasses of Tyskie beer. Plates are weighed and charged 3 PLN for 100 grams. The Delikatesy on the Old Market Square open 24 hours sells inexpensive homemade pierogis and Kielbasa, that are ready to heat and serve; along with other essential groceries. Helpful hint: The Galeria Krakowska Shopping Mall has a large Carrefour grocery store on the top level with good selections and prices. 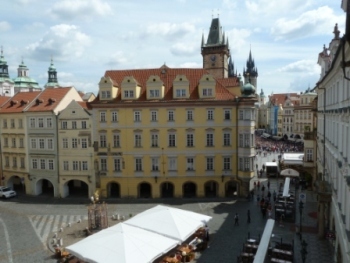 Our spacious two bedroom apartment in Prague was in the perfect location. 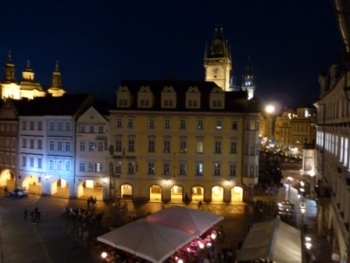 This was our night and day view of the main square in Old Town. 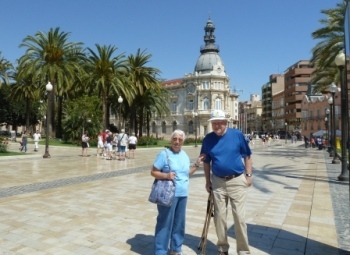 There were parties for the upcoming Euro Cup soccer matches, concerts, food booths and throngs of people; but our bedrooms were away from the square and we had a quiet sleep. Restaurance V Cipu - on V Cipu Street - Lunch menu offers about 8 plate lunch choices - all under $5 USD. Lots of locals, office workers. Menu has English translations. 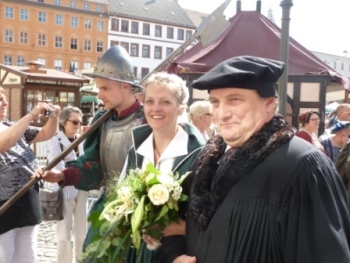 In Wittenburg, Germany our family attended a festival weekend celebrating the wedding anniversary of Martin Luther & his wife, Katherina. 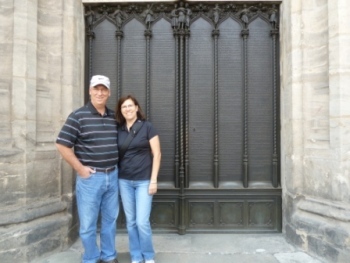 We stood in front of the famous Castle Church doors. 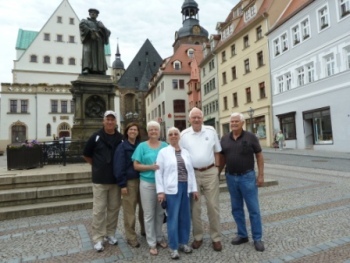 In Eisleben Diana and Clayton joined us at the Martin Luther Monument in the city center. 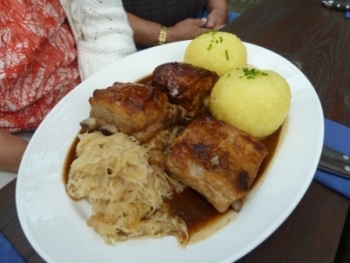 For lunch in Eisenach after a visit to Wartburg Castle, Diana ordered a local favorite - ribs, sauerkraut and some honkin' huge dumplings. Lienen is the city of the our Hölscher ancestors. 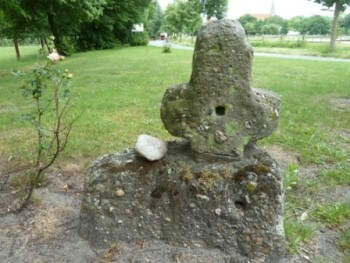 The stone processional cross, known as the Cruitzhecke, dated from the 1500s was located in a hedge row next to our family property in 1711. 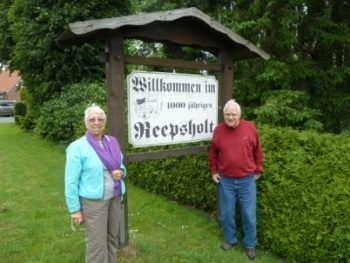 Dad's side of the family is from the town of Reepsholt, which the sign proclaims is more than 1,000 years old. On Sunday we attended services at the Lutheran church of our ancestors. A nearby ancestral town, Hesel, is only a collection of large brick combination barn/houses today. 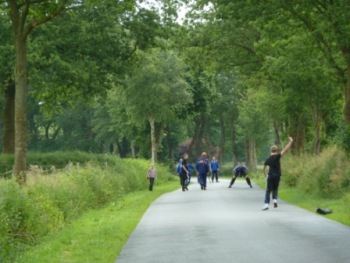 But on the road there we saw at least 50 people enjoying a bowling game called Busseln. 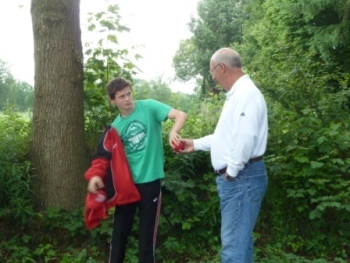 Paul got a quick lesson from one of the players.